The idea of establishing a Faculty of Agriculture dates back to 1947 when four disciplines (Arts, Science, Medicine, and Agriculture) were incorporated unto then Yaba Higher College that transformed to the University College and was moved to Ibadan. While the faculties of Arts, Science and Medicine took off in 1948, the Faculty of Agriculture took off in 1949 with Mr. W. H. Baker, formerly an officer of the Nigerian Government Department of Agriculture, as its Professor and Dean of Faculty. Nine other staff assumed duty in 1951/52 academic session. They were Dr. J. C. Sawyer (Agricultural Botany), Dr. K. Ebes (Tropical Agriculture) Mr. G. H. Casmell (Agricultural Entomology), Mr. R. M. Jackson (Plant Pathology), Dr. V. A. Oyenuga (Animal Nutrition), Mr. M. Miliken (Agricultural Economics), Mr. P. H. Nye (Soil Science), Mr. J. O. Fatimehin (Demonstrator in Soil Science) and Mr. M. C. Hatterly (Farm Manager). Mr. P. H. Nye left the University in 1957 and was immediately replaced by Dr. (Mrs.) Elizabeth Alexander. With this modest assembly of 10 staff (8 Lecturers, 1 Farm Manager and 1 Demonstrator) academic activities started in 1951/52 with only one student, Mr. Joseph Akinwolemiwa, who graduated in June 1953. He was followed by 4, 3, 4, 6, 8, 10, 11, 7, 9, and 14 in 1954, 1955, 1956, 1957 1958, 1959, 1960, 1961, 1962 and 1963 respectively. The cumulative students enrolment as at 1997 was 5,209. Although the Faculty started teaching in 1950 with only one student and ten academic/technical staff, today in spite of difficulties, there are over 1,200 students and 128 members of academic staff consisting of Professors, Senior Lecturers, Lecturers and Assistant Lecturers.The honors course in Agriculture was introduced in 1958/59, and the June 1960 students were the first graduate with the honors classification. From 1948 to 1963 the University awarded degrees of the University of London under a scheme of special relationship. However, in 1963 the University received it own charter and became autonomous as the University of Ibadan and started to award its own degrees. 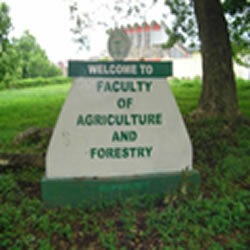 Postgraduate courses leading to the degrees of M.Sc., M.Phil and Ph.D. were introduced in the various departments of the Faculty in 1960 and later Diploma and Certificate courses both at the postgraduate and Sub-Degree levels were offered in Agricultural Extension and a various aspects of tropical agriculture and forestry. Many of the students that have graduated from the Faculty hold responsible positions in commercial firms and public services of the Federation of Nigeria and in other countries of West Africa, as Agricultural Officers, Specialist Research Officers, Extension Services Officers, Directors of Research Institutes, Conservators of Forests, National Parks and Zoos, University Professors, Lecturers, Quarantine officer, Bankers, Accountants, etc.